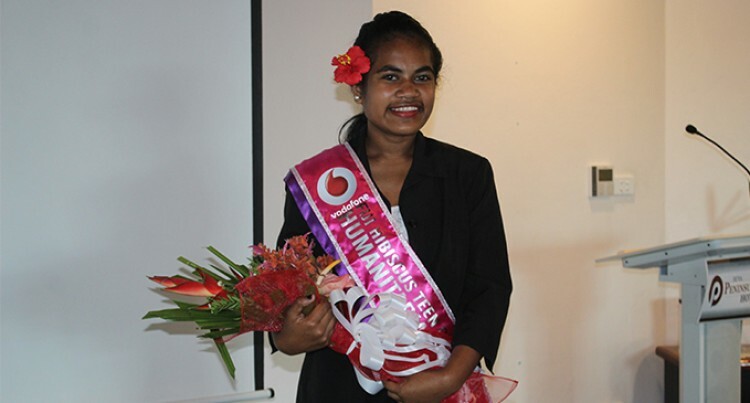 Suva Sangam College, Year 10 student and Miss Alvin’s Electrical Services Ilein Nabukete won the 2018 Vodafone Fiji Hibiscus Festival Teens Humanitarian Award. The event was held at the Peninsula Hotel in Suva yesterday where the 10 Teen Contestants presented their humanitarian projects. 16-year-old Ilein, originally of Delasui in Tailevu and eldest of four siblings, was in tears when she was awarded the sash for presenting the best teen humanitarian award. Her presentation was on how the beauty contests such as the Vodafone Fiji Hibiscus Festival and other festivals around the country contributed to the conservation of our environment. Ilein said her presentation was true because she believed pageants contributed to the conservation of the environment. “I want to help contribute in making Fiji a better place to live in, a peaceful place for us and people who visit our country,” she said. “Using the pageants is a great platform to advocate such issues regarding the betterment of our environment. “My advocacy is on conserving the marine ecosystem by using traditional ways of conserving the environment, including the marine life.